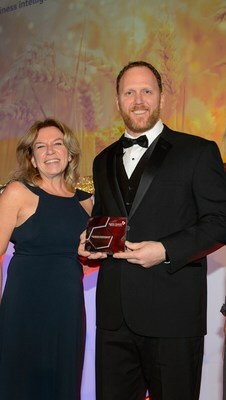 FMC Corporation, an agricultural sciences company, took top honors in several categories at this year's Agrow Awards, an international competition honoring the top advancements in agriculture. FMC won Best R&D Pipeline and Best Application Technology for its at-plant 3RIVE 3D® application system. In addition, Dr. William E. Barnette, retired director of Discovery Chemistry for FMC, was recognized with the prestigious Agrow Lifetime Achievement Award. The Agrow Awards recognize the industry's successes, setting a benchmark for excellence while rewarding innovative ideas and concepts that have pushed the boundaries of what is possible. Recipients are chosen from entries taken from around the world and adjudicated by a distinguished judging panel. Crop protection discovery research is critically important to helping farmers produce an abundant and safe food supply for a growing world population. "We are honored to be recognized for our research," said Dr. Kathleen Shelton, FMC chief technology officer and vice president. "FMC has its most robust innovation pipeline in a generation. Our R&D pipeline is focused on new active ingredients and new modes of action to address growers' insect, disease and weed challenges around the world, including resistant pests, which are a serious threat to crop production." Dr. William E. Barnette, retired director of Discovery Chemistry for FMC, was recognized with the prestigious Agrow Lifetime Achievement Award. Over his 30-year career with FMC and DuPont Crop Protection, Dr. Barnette has been an esteemed leader in identifying new crop protection active ingredient development candidates. FMC won the Best Application Technology category with its patent-pending 3RIVE 3D® application system, designed to deliver low volumes of crop protection solutions to the furrow during planting. "Growers are looking for crop protection delivery technologies that are more sustainable, precise and convenient. The 3RIVE 3D system is a revolutionary at-plant crop protection delivery platform for seedling defense and yield enhancement," said Rick Ekins, FMC Precision Platforms lead. Currently used in corn and soybeans, 3RIVE 3D technology is being tested in sugar beets, cotton, dry beans, sunflowers and more. A robust pipeline of new 3RIVE 3D formulated products are in development including ones that combine multiple active ingredients including insecticides, fungicides and biostimulants. FMC Corporation provides solutions to growers around the world with a portfolio of proprietary crop protection products and a robust pipeline fueled by innovative discovery and development capabilities in crop protection, plant health and professional pest and turf maintenance solutions. In October 2018, FMC conducted an initial public offering of its Lithium business. The new company, Livent Corporation, is approximately 85 percent owned by FMC and is expected to be spun off on March 1, 2019. FMC employs approximately 7,300 employees (including through Livent) around the globe. To learn more, please visit www.fmc.com. Always read and follow all label directions, precautions and restrictions for use. FMC, Zone of Protection and 3RIVE 3D are trademarks of FMC Corporation or an affiliate. ©FMC Corporation. All rights reserved.